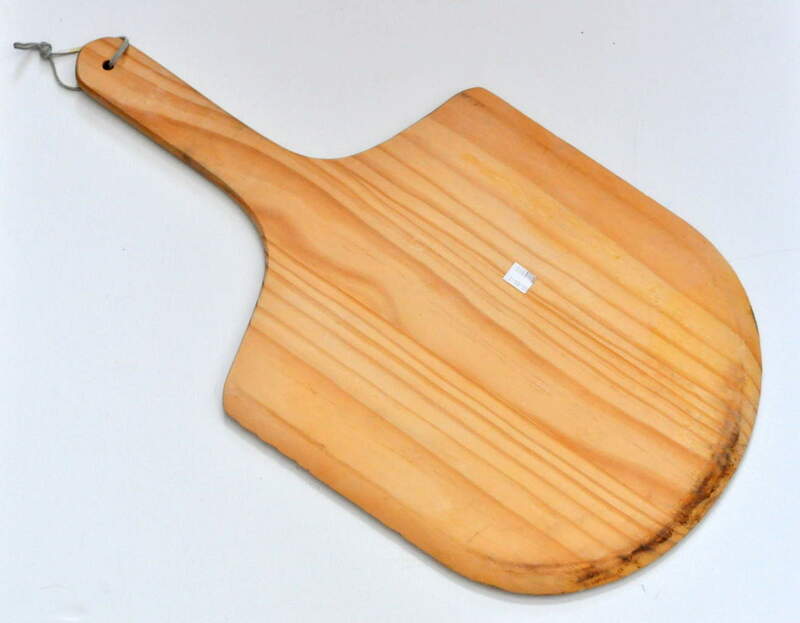 Oh boy do I have a thing for pizza peels!I have been on the hunt for one and found this large pizza peel just in time for my favorite bloggers to put together a Thrift Store Decor Bog Hop! I originally wanted to paint it but the kitchen “EAT” signs are a bit overused these days. So searching around for ideas I found a Pizza Peel Wall shelf by Pottery Barn and also Joss & Main. 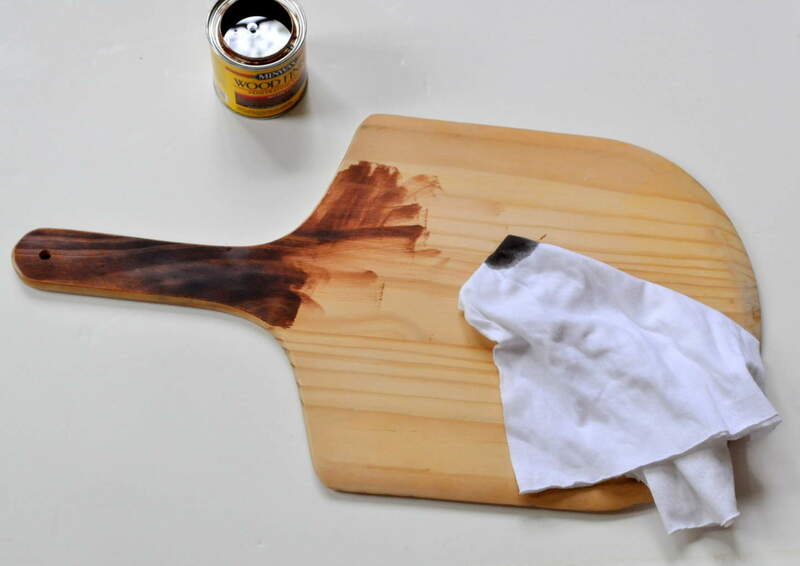 Clean your pizza peel and remove any adhesive or oils. Sand down the edges or rough areas. 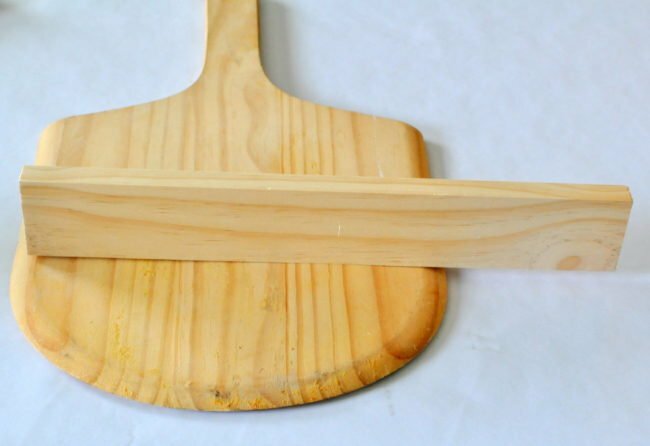 Measure the scrap wood on the pizza peel to cut the shelf. My peel had beveled edges, I made my shelf 1/2 inch shorter on each side, than the width of pizza peel. This was the shelf will lay flush against the wood. Cut the wood for shelf with a hand saw. Cut a square out the left over wood the same width of the shelf. Cut the square diagonal in half into two triangles. These are your brackets for underneath the shelf. Sand all the pieces and make sure the all fit together seamlessly. If not sand the wood again until everything fits. Stain all pieces using a rag. Let the wood stain completely dry overnight. Seal the stain if you choose. I left mine alone and the finish looked great. Glue all pieces to the peel using wood glue. If you feel your shelf is not sturdy enough, you can add two wood screws through the back side of the peel through the shelf. The glue was very sturdy on my peel so I opted to skip this step. Add your hooks to the front center of the shelf using E6000 adhesive, not wood screws. This pizza peel was so thin I was afraid the wood would split when screwing in the screws. Plus the screws with the hooks were way too long and would stand out in the back of the peel. I added the hanging hardware to the pack of the peel so it will hang level and not move. I used E6000 to adhere the hardware as well. Lastly add a small piece of leather to the handle and that’s it! I’m in love! This would make such an interesting piece of wall art for your kitchen, rustic dining room or a fun coffee station. Now for more Thrift Store Makeovers! I’m so excited to bring you this Thrift Store Decor Upcycle Challenge! 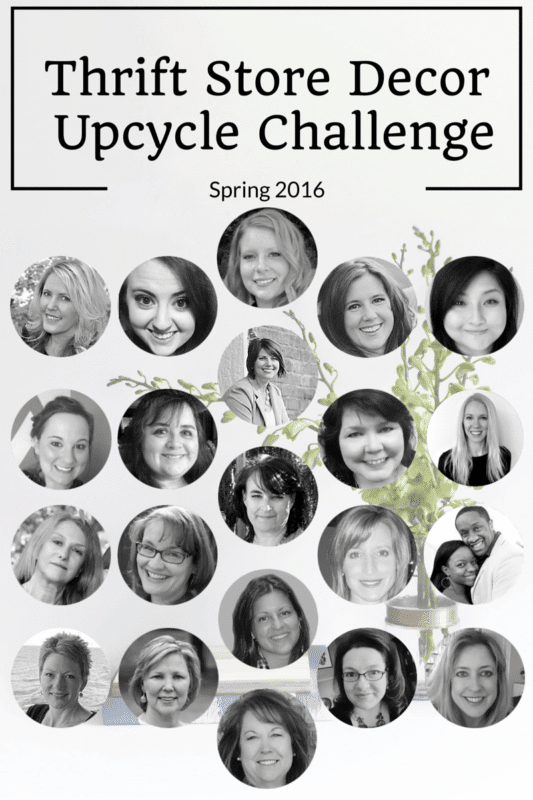 I’ve teamed up with 20 of my favorite bloggers for this Thrift Store Blog Hop. The rules were simple–take an item(s) from a thrift store, yard sale, resale shop etc. and transform it into a new piece of home decor. There was no budget, or theme to stick to so we were free to let our creativity run wild! Be sure to check out my fellow bloggers’ projects too! What a lovely idea and a cool makeover! Lovely color! Thanks so much for featuring me! So excited!have a great weekend! Kim, this is unique and different from all those ‘EAT’ signs! Love it and especially the stain rather than paint. The leather on the handle is a nice touch too! Sharing this on my FB page this weekend. Thank you Shirley! I was going paint it with letters first, but then change my mind and am I glad I did. I love this! Makes me want to go and find one of these pizza peels. Will definitely keep my eyes open for one of these in the thrift shop. Thanks so much Erlene! I may need another one too. Maybe 3 dfferent sizes, lol. This is such a cool makeover, Kim! 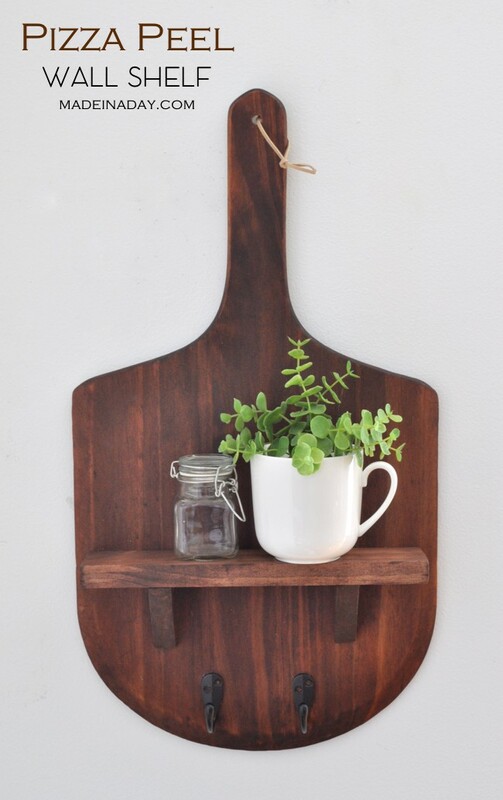 I love that you turned your pizza peel into a shelf – so creative! I absolutely love this! I look forward to making one for my own home soon! It would also make a lovely housewarming gift!! Thanks for sharing! I love this idea!! How fun! I’ve chosen this as my favorite link from Link Party Palooza and will be featuring it on all 4 of our sites! Thanks for linking up, hope you’re having a great weekend! Thanks so much Stephanie! So excited! glad you liked it! Hi, Kim!! Your pizza peel shelf is so cool!! I’ve never run across one but if by any chance I do I know what to do with it, love it!! This is so cool Kim! I am lovin’ the pizza peels too these days. Now I’m going to be on the lookout for one at my thrift stores. I love this idea. I haven’t seen any of these in my area but I am going to have to keep my eye out. I love everything about this! The stain color is gorgeous and it is such a creative piece! I want one of these in my kitchen – so cute and clever, and what a fun project. Oh my gosh, this is incredible! I didn’t know I needed a pizza peel in my life, but now I’m on the hunt! What a great idea! 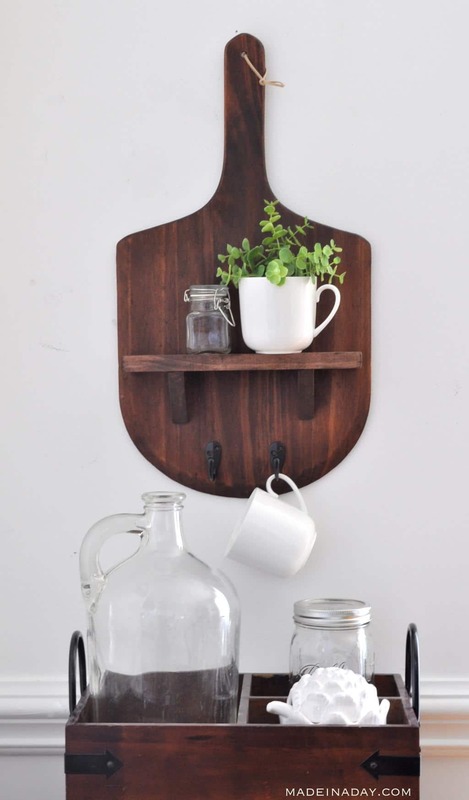 This makes a cute shelf and perfect wall decor for your kitchen. After seeing this, I’m on the lookout for pizza peels when I’m thrifting. Kim, This is a great makeover. I see this pizza peels thrifting all the time. I love the color you chose, and it looks great the way you have it displayed. Thanks so much Sherry, It came out better than I thought! Now I need to rearrange my kitchen to find a great spot for it. I commented on your wall shelves too.